Use will power to over come power of fear. | Experimental Designs Consulting, Inc.
Use will power to over come power of fear. Okay…so I’ve been writing a lot these days, but I don’t know if this is serving my fellow managers out there in science or more for my therapy sessions. I believe that its serving more as a therapy. I know, it may sound a little self serving, but I can explain how it can benefit you [managers]. It really comes down to the battle between will power and fear. I fear that I don’t communicate well, but I know I have to practice to get better, making me more confident in my communications. So I push myself to write, again, and again. By shear will power, I improve my communications. Managing anything in life is difficult, especially when emotions are involved. Emotions are the motivating factors that we draw from in order to take necessary actions. The two motivating factors I’m going to discuss is will and fear. I will talk about how it can be used to gain ground on goals and how to persevere through adversity. Managing actions toward a goal is a difficult process that I’ve had to learn myself. My blogging experience is part of the skills that I’m developing in order to improve my writing and communications. I’ve struggled because of fear, but I preserver because of my own will power. Fear is one of the most powerful emotions. Its an emotion that is based in the preservation of life. Many people understand this fact all too well. The only catch here, in management, is that there isn’t any actual mortal danger. Its all in your head. Its in your limbic system, to be exact. The good old “flight or fight” response. I tell you this, because you should understand where the fear is coming from in order to use logic to thwart its paralyzing effects. I’m going to use a classic manager’s dilemma, feedbacks, as an example. Particularly, negative feedbacks have a tendency to be more difficult for new managers. You know you have to give a negative feed back to an employee or a colleague, but you’re afraid. What are you afraid of? Your life is not in actualdanger (well…lets try to avoid “going postal” puns here). The fear is usually rooted in social status and the challenges that is needed to establish your status. If the colleague or employee challenges your authority, you may loose status. But, then again, if you don’t give feedback, you’ll loose status anyways. Therefore your fear is rooted in the need to be socially secure. So how do you regulate those fearing emotions in order to actually give a negative feedback? Will power! Well, “will power” is actually based in a personal belief system that has been build out a cumulation of your emotional experiences. For example, assuming you have a great long running relationship with your mom, you belief that she loves you and no one can question that love. You hold that belief to be true. You know it to be true, because you’ve built a relationship over time of emotional exchanges. So therefore, if your mom tells you to jump from the roof into her arms and she’ll catch you, jumping then becomes a viable choice. Your belief in her love pushes your belief system in the laws of physics. Assuming your belief in her love is stronger than your belief in physics (as it is with most children), you make that jump. You jump against your fear of pain. So with this in mind, you need develop the relationships over time through one one ones and continual studying of goals. Each time you have that emotional experience, you expose yourself to it. Keep focus on the ultimate goal and continue to adjust your actions toward that goal. The more you do that, the better you become at going against those fearful moments. Practice makes perfect. The human will is a powerful emotion that’s based in proliferation. This is what keeps us growing and replicating. If fear dominated more than will, then I wouldn’t be writing this blog and you wouldn’t have to give negative feedbacks. So, understand where the fear is coming from and use your belief in your goals (or skills) to assert your will power. Don’t give into fear. 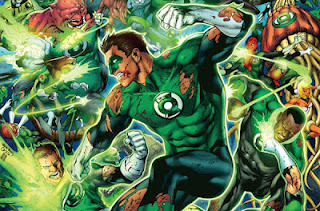 Just to note, I used this image of Green Lantern because, 1. I’m a huge comic fan, but 2. the super hero, Green Lantern’s philosophy uses the idea of will powerover coming fear and how we can over come anything if we have faith in our will. Check out the comic series or movie. There’s plenty of examples that people have used this philosophy to overcome fears in their own lives.